All Things Lovely: Don't be boring! 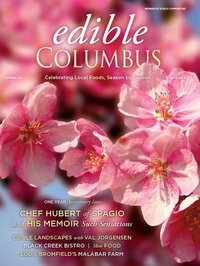 The recent issue of Edible Columbus (to which I contributed the article about Malabar Farm) has an interview with Michael Ruhlman (pg 13), the author of collaborative cookbooks for iconic restaurants like French Laundry and Bouchon. As enamored as I am of his elbow-rubbing with the likes of Thomas Keller and Eric Ripert, Ruhlman made a comment at the start of the interview which resonates through me. It wasn't directly about food, but rather about "cooking being a shadow urge of writing." I never really linked the two "urges," but I certainly have both. Love food. Love to write. Love to write about culinary experiences. Writing and cooking are my creative outlets. Both nourish my soul (the latter nourishes my family). Both require organization, technical skill, passion. Writing and cooking will be eternally linked in my mind. I'm a huge fan of several foodie blogs and spent a little time digging around for insight on food writing, but ended up back at the Michael Ruhlman interview, who when asked about food blogging, summed it up in three words. "Don't be boring." A bit of advice I'll take to heart when blogging about Patricia Wells's Salad as a Meal cookbook. Wow. I never connected the love of writing and of creating in the kitchen. I love to cook, and I love to write and I can see the creativity of the two environments being synonymous in my life. Now that the idea is planted, it is like aha! Brilliant. I am doing the Salad a Meal challenge although I just stumbled upon it the day before it started and haven't gotten the book yet. Following your progress! Great writing, and great cooking.